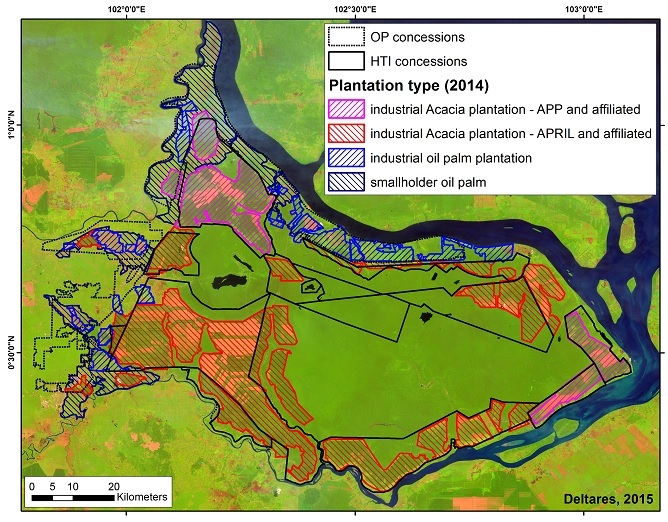 A new Deltaresreport, commissioned by Wetlands International, reconfirms that pulp wood and oil palm plantations in peatlands cannot be managed sustainably. Such drained plantations will inevitably suffer from severe land subsidence, increasing flooding and eventually production loss. The report also provides evidence that fires only occurred in drained peatlands and therefore inside or near plantations. Independent science institute Deltares assessed the impacts of peatland drainage for plantations on the Kampar Peninsula peat dome, which probably is the largest single peat dome in Sumatra and Kalimantan, using the latest remote sensing techniques and scientific understanding of lowland peatland response to drainage. Modelled likely flood extent (HWL) and drainability (FDL) for (right) 2014 and for (left) 50 years after 2014. According to Wetlands International, pulp and paper companies APP and APRIL, which hold the largest concession areas on Kampar Peninsula, need to phase out their drainage-based pulp wood plantations from peatlands and rewet the areas that they drained for their plantations, to avoid floods and large scale loss of land productivity and to curb fires. Sustainable alternatives on rewetted peatlands need to be developed. There are regular claims from the pulp wood industry that peat loss and subsidence can be curbed by using improved water management techniques. But the report underscores that such techniques, including the ‘eco-hidro’ peatland management model developed by APRIL, can only reduce the rate of subsidence and by not much more than 20%. Another finding is that despite that most companies in the area have no-fire policies, 99% of the numerous fire hotspots that occurred on Kampar Peninsula over the last 15 years were in plantation areas. This clearly shows that even the largest companies have not been able to prevent or control fires. 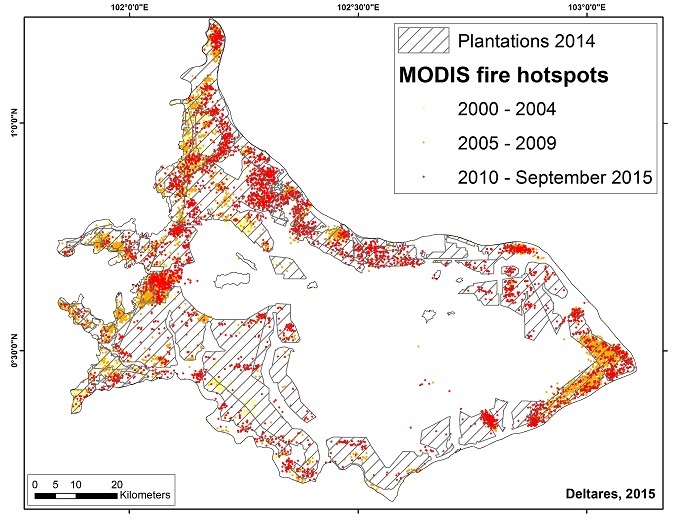 Extent of 2014 pulp and oil palm plantations and fires in the study area. APRIL claims that by developing their Acacia pulp wood plantations in a ring-shaped area covering most of the outer margin of the Peninsula, they help to protect the forested inland parts of the Peninsula. However, drainage and subsidence inevitably affect the hydrology of the adjacent areas which are part of the same hydrological system, enhancing the fire risk in remaining natural forest and peat areas. The research covered an area of 674,200 ha. By 2014, almost half of the area (43 %) was converted to plantations, predominantly (71.7 %) to Acacia plantations for the pulp and paper industry. The plantations also threaten biodiversity, including a population of the endangered Sumatran Tiger and cause the release of vast amounts of carbon emissions as a result of peat drainage. Wetlands International points out that peatlands can be cultivated with crops that are adapted to the wet soil conditions – a practice known aspaludiculture, which can provide a sustainable resource for industry and deliver economic prosperity to local communities. This and other recommendations are included in a Roadmap towards sustainable peatlands management for the Indonesian pulp industry, recently developed by Wetlands International and Indonesian civil society partners. The organisation also recommended the Indonesian government to develop aNational Peatland Conservation and Restoration Strategy to curb the fires and haze disaster, carbon emissions from peat and flood risk. The Indonesian government plans to form a Peatland Restoration Task Force and develop regulations to improve peatland management and curb peatland fires, greenhouse gas emissions and haze. Wetlands International also calls upon the Indonesian government to review current and new policies in light of new scientific evidence of peatland subsidence and flooding.